Oracle OpenWorld 2014 is over. Just under a week, full to the brim with information, events, people, energy, plans, hopes and expectations. I have learned many, many things. Small things, important facts, huge insights and many great people. In this article, I will attempt to sum up the largest themes of the conference as I have interpreted them. In subsequent publications, I will focus on some of them as well as discuss less grand but equally interesting findings. Note: my insights are derived from keynote sessions, press releases, general sessiteons and other conference sessions, discussions in the hall way etc. However, they are my personal interpretation and a safe harbor statement should be in order: don’t take my word for anything – use my comments as a lead to start doing your own explorations. 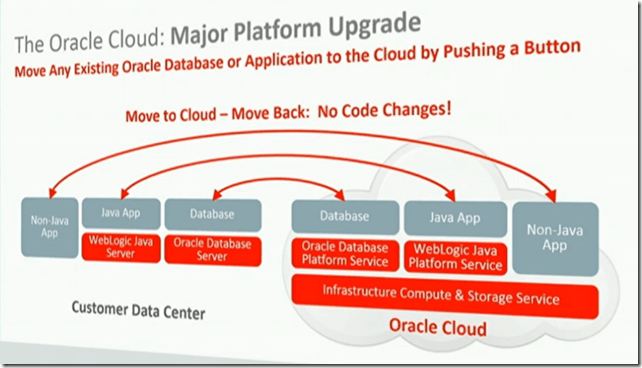 Oracle is working very hard to roll out an extensive set of PaaS services. This concerted effort takes precedence over virtually anything else. New functionality in any platform product is developed first for the cloud and only then for on-premises application. Only few of these services are fully available today – per direct, to anyone, according to well defined conditions. However, many will be made available in the near future – say the next six months. The availability of Oracle’s PaaS services will have the potential of bringing the Oracle Platform within reach (again) of smaller and midsize organizations that currently cannot afford the on-prem licenses. Without substantial investment or long term commitment, it should be possible for the Oracle platform to be flexibly entered, and left as well. The fact that Oracle’s SaaS products – a very substantial catalog these days with over 20k customers, thanks to a large degree to many recent acquisitions – run on Oracle’s PaaS services and are explicitly designed to be customized, extended and integrated with using these PaaS technologies creates a lot of opportunities for partners (such as AMIS). For example through the Oracle Cloud Marketplace, partners can offer reusable extensions and integrations that are deployed and run on the Oracle PaaS environment, integrating with the customer’s SaaS instance. Note: 19 out of the 20 largest SaaS products run on the Oracle platform, Workdays being the exception. The Marketing Cloud is serious business at Oracle, claiming to be the largest player in this space. The new Data as a Service fits into this area (a new service that makes marketing data available from countless sources, based on the BlueKai acquisition), as does the announcement of the integration of Box.com in the marketing cloud: Box’s content collaboration platform, which allows marketers to make assets available to designers and other stakeholders, will seamlessly mingle with Oracle’s Marketing Cloud. The integration will allow Marketing Cloud customers to develop content with tools such as Microsoft Office products and PDFs, and then instantly convert them into HTML5. Additionally, the integration will enable folders in Box to automatically sync with Marketing Cloud’s content store, making them available for campaign usage on Oracle’s cross-channel marketing platform. Longer term, Oracle strives for Private and Public Cloud parity: the same facilities and functionality is offered in the cloud and on prem. The same technology stack is used for implementing and administering the cloud and on prem environments. The same components can be deployed on the PaaS services as on the on prem platform. Eventually, we will be able to move deployed applications from on premises to cloud and vice versa. Beyond that, complete environments – first shutdown and later on even running, live environments – can be moved between the local private cloud and the remote cloud environment. This is potentially an important edge Oracle’s PaaS cloud will have over competitors: it offers the same platform on premises as in the cloud and allows therefore hybrid topologies with mix and mash between environments. Even when on prem is desirable, yet a new environment cannot be provisioned very rapidly, a project may start out in the cloud, then seamlessly move to on prem when the provisioning is complete. Some of the more recently acquired SaaS offerings from Oracle will soon be migrated to ADF: Right Now (ServiceCloud), Taleo and CPQ (Configure, Price , Quota – aka Big Machines). This is an important boost for ADF and its continued importance to Oracle as its enterprise development framework. One of the first cloud services ever offered by Oracle was the Oracle Social Network. This Facebook-like facility- targeted at the enterprise environment – has been available with all SaaS offerings from Oracle. It offers the option to co-workers to engage in ‘social conversations’ – threads around common activities, cases or objectives. A conversation can include business objects – such as orders, customers, projects or general ledger entries – and documents (integration with the Document Cloud Service). The conversation can be accessed from the context of the business object – and vice versa. One organization that is using this Social Network avidly is Oracle itself. In the very near future, Oracle is opening up this Social Network: partners creating extensions to SaaS applications and (probably) anyone creating and deploying applications on the Oracle PaaS can integrate with the Social Network and can expose their own business objects as objects in conversations. If I understand correctly, it will be possible to sign up for the Social Network for customers who to not work with any of the SaaS offerings from Oracle. Oracle is – still somewhat tentatively perhaps – embracing OpenStack. Both with Oracle Linux and Oracle Solaris it offers a full distribution of OpenStack. For example: the combination of OpenStack and Oracle Solaris has been engineered for private cloud deployments, providing a secure, reliable, and scalable platform for agile application provisioning and self-service virtual environments. The Oracle OpenStack for Oracle Linux distribution allows users to control Oracle Linux and Oracle VM through OpenStack in production environments (Oracle OpenStack for Oracle Linux is available as part of Oracle Linux Premier Support and Oracle VM Premier Support offerings at no additional cost; Oracle OpenStack for Oracle Linux is available as a free download from the Oracle Public Yum Server and Unbreakable Linux Network (ULN). An Oracle VM VirtualBox image of the product is also available on Oracle Technology Network, providing an easy way to get started with OpenStack.). Canonical – the company behind Ubuntu – will support Ubuntu as a guest OS on Oracle Linux OpenStack, and Oracle will support Oracle Linux as a guest OS on Ubuntu OpenStack. Canonical will test Oracle Linux as a guest OS in its OpenStack Interoperability Lab (OIL) program. Oracle Virtual Networking now also supports OpenStack. The Oracle Virtual Networking OpenStack Neutron plug-in, announced at Oracle OpenWorld, is based on the OpenStack Icehouse release and enables all of Oracle’s software-defined networking (SDN) and network fabric capabilities to be created, provisioned and managed by the OpenStack framework. Oracle has embarked on “Software in Silicon” – a program to achieve 5-10 times performance improvement for core database operations by baking some database specific operations into the CPU itself. For example: the Oracle NUMBER type is a software implementation on top of every platform specific’s native types. When NUMBER is embedded in the processor, enormous performance gains can be achieved. Additionally, the lowest level filtering operations can be performed “in silicon” (similar at a very different level to the smart scan running on the storage cells in Exadata). At that same level, in line level decompression allows much more data to be placed in memory and still be accessible at very high speed levels. More database specific implementation aspects can be brought into silicon – starting with Sparc M7 processor (is due to launch sometime next year) and potentially offered to/by other vendors (such as Intel) as well. Even though Big Data (and even more so last year’s big thema of IoT) was a somewhat less pervasive theme at the conference, Oracle is certainly making important steps towards making Big Data more accessible to organizations in a pragmatic way. Through Big Data SQL, non-relational data on an Hadoop HDFS can be accessed from within an Oracle Database using standard Oracle SQL. To developers and tools alike – many of whom are pretty fluent in SQL but much less so in the technologies used to access data on Hadoop – this makes big data very accessible. 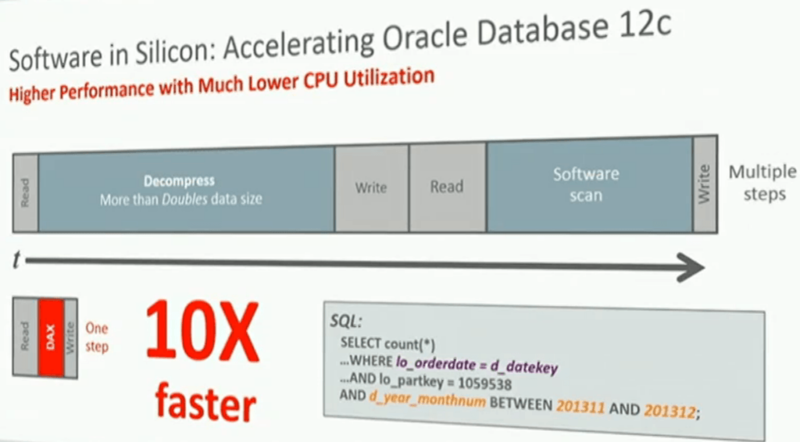 When Big Data SQL is leveraged with the Oracle Big Data Appliance, the BDA will employ smart scan – a clever form of preprocessing of data on the Hadoop cluster which ensures that far less data – and only the relevant bits – are moved from the Big Data world to the memory and CPUs doing the Oracle Database SQL processing. This mechanism is similar to the smart scan facility in Exadata Storage Cells. Other advances around Big Data are Big Data Discovery – an Endeca based in-browser visualizer of meaningful data patterns – and the Analytics Cloud with the Oracle BI Service. These services make it very easy to make sense of Big Data and figure out the ways in which meaningful reporting and insight-extraction can be set up on top of Big Data gathering. In many sessions, Oracle staff discussed the Line of Business (LoB) user who has to be empowered. Gartner speaks about the citizen developer – and Oracle means about the same thing. The idea is that with no or only limited intervention or preparation by IT staff, business users can do meaningful things themselves, such as get insights from (big) data, configure simple dashboards, create straightforward data entry and data explorations apps for mobile devices etc. Who can work with Excel should be able to do many useful things in the world of Oracle (and Oracle Cloud) as well. Some tangible examples for products (in the making) under this theme include StreamExplorer – for real time data analysis -, MAX – the mobile application accelerator-, Big Data Discoverer, BI Cloud Service and even the Process and Integration Cloud Services. Important themes in the area of User Experience are context (as in Gartner’s context aware computing) and capture. The form refers to how a user experience should be enriched based on everything the system knows about the user and her (current) circumstances. Do not make the user enter data or make choices that can already be arrived or at least reasonably guessed at. Capture refers to the stage before data is handed over to ‘the system’ in a form that the system knows how to process. Data that is ‘out there’ or that lives in the heads of human actors have to transferred and converted into the application. A process that is typically time consuming, cumbersome error prone and interruptive. Any improvements in this stage make life a lot easier for users and have the potential of dramatically improving speed and accuracy. Oracle (through the Applications User Experiences team) is making very interesting steps to create a much better capture stage. Apart from mind reading (that is probably the next phase), any means of capturing data is investigated and explored – including wearables, beacons, OCR, speech recognition etc. Oracle’s Mobile story is becoming quite clear. All SaaS applications have (or very soon will have) mobile apps to provide access to quick “glance and scan” activities – relevant insights and alerts, straightforward decisions and manipulations. These mobile applications are or will be created using Oracle’s own Mobile Application Framework (MAF), using the Alta user experience theme. MAF is available to anyone who wants to create mobile apps. MAF allows cross platform (iOS, Android and soon Windows as well) development of native applications that interact with device features (GPS, phone, camera, contacts, email, etc), can use local database storage and run a local, on device JVM. Development with MAF is more declarative than native ObjectiveC or Android app creation. Many higher level components – as well as a tailored IDE – are available for productive development. Especially noteworthy are the rich data visualizations available out of the box with MAF. The Mobile Application Accelerator (MAX), a browser based tool that allows very visual and declarative development of fairly simple, straightforward mobile applications, helps ‘citizen developers’ create MAF apps – that could subsequently be refined and extended by (real) developers. Oracle recognizes that most developers will probably not use MAF for their app-development. However, they still need access to data services and would be served well by a rich backend that takes care of common concerns such as cross platform push notification, user management and access control, data enrichment and caching of (lookup) data, management of cross device personal cloud and long running conversations and more. 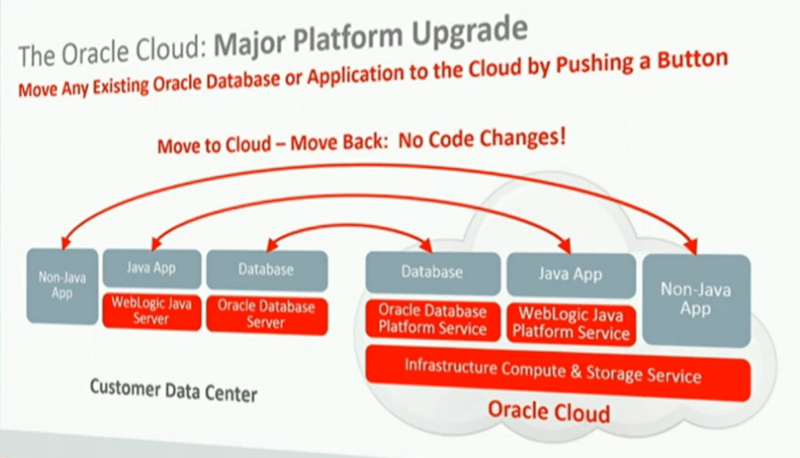 The perhaps most important new PaaS cloud service to be launched by Oracle is the Mobile Cloud Service. This service provides the capabilities mentioned above to back any number of mobile applications with shared (mobile) services as well as controlled access to SaaS APIs and on premises enterprise systems. The Mobile Cloud Service is as an end-to-end infrastructure for building apps connected to Oracle’s software portfolio and third party SaaS and on prem applications. With MCS – APIs are composed as mash-ups of other APIs and of services exposed by SaaS products and on premise enterprise systems. These APIs – typically published as REST-services – can be consumed by subscribed apps. Oracle is first targeting mobile apps with the MCS, but any application or integration platform requiring access to REST-services could leverage the MCS. MCS offers many other capabilities in addition to the creation and management of these APIs, including identity and access management, caching, push notifications (interacting with Apple’s and Google’s push notification services), analytics on usage, monitoring. With MCS – enterprises can be mobile enabled with very limited effort, investment and risk. No new users access the enterprise, no additional load from potentially thousands or more devices has to be catered for, no extreme availability constraints have to be put on the backend systems, no outsider developers need access to various systems etc. MCS can turn out to be a big mobile enabler. A term used in several sessions was density – for example on the PaaS platform. This basically means: do more with less IaaS resources (such as memory, CPU and even disk). It turns out that for example class loading on JVMs can be done a lot smarter, with far more reuse instead of duplication of objects. In order for Oracle to create a truly scalable, lean (affordable) cloud environment, it is important that PaaS components use IaaS services and other PaaS components in a sustainable way. The work Oracle is doing for example on WebLogic will benefit organizations creating a Private Cloud based on Oracle’s PaaS platform. Note that the Oracle Database 12c multitenant database architecture has in part a very similar goal:reduce over all resource consumption by sharing the resources across multiple tenants (pluggable databases). It seems likely that the work being done by the WebLogic team will benefit not just the Oracle public PaaS Cloud and the Exalogic private cloud, but the core Hotspot JVM as well. The initial Note: multitenancy is an important theme for the core Java EE 8 as well as Java SE 9 platforms. Multitenancy will be an important feature (or even architecture) for WebLogic in the near future. It will subsequently also become engrained in other PaaS components, such as SOA Suite and presumably WebCenter Content. As Larry Ellison mentioned in both his keynote sessions, the new job at Oracle is SECURITY. It is of course crucial for the Oracle Public Cloud to be very secure. Enticing organizations to entrust their data and business process execution to the Oracle Cloud will not be easy. Any security breach or even a whiff of suspicion of lack of security will make that task virtually impossible. Security at every level – between Oracle and the multiple tenants as well as at the level of all users within a tenants realm (coordinated by the tenant himself) has to absolute. The attention for security measures at every level in the stack – from software in silicon to anti-social-engineering – will be large. And again, this focus in the public cloud will improve the platform and as a result help users of the same stack in their private cloud as well. When Oracle fixes things at their PaaS Public Cloud level in the same stack used on premises, the solutions are probably good enough for most on premise use cases too. Oracle is not wildly popular with the young crowds. At university, it does not seem as if Oracle technology is a prime topic on the curriculum (with the possible exception of Java). The average age at Oracle user group gatherings in many countries is still increasing. The influx of young Oracle developers and DBAs is not large. The push from below at enterprises to further invest in Oracle technology may as a result not be overwhelming. Additionally, this ‘legacy’ community, while loyal, is not always as forward looking as it probably should be. It is not uncommon for veteran Oracle developers to create code – SQL, PL/SQL – that is impressively backward compatible with milestone releases like Oracle7. Think about that for a moment: Oracle has invested long years and large amounts of money to advance the database from where it stood in the mid-90s to where it is today. And organizations have to pay licenses that reflect the value of all these functional and non-functional enhancements. Yet because of lack of up to date knowledge on the part of administrators and developers, much of this potential remains untapped. The perceived value of the investments in the Oracle platform could substantially be lowered because of this – threatening the longer term adoption of Oracle’s technology at an organization. At the very highest echelons within Oracle – Thomas Kurian, Andy Mendelsohn to name but two important crusader – the above has been recognized and identified as a priority. Steven Feuerstein (PL/SQL community leader and Oracle Database development evangelist) has been hired and tasked with both increasing the popularity of Oracle outside the current community as well as improving the usage of modern facilities and features in the Oracle platform by existing members of the community. Steven is putting together a team to assist him in that challenge, as well as reaching out to the community to support him. Watch for terms such as YesSQL and LiveSQL as well as new ones yet to be developed to learn more about this initiative. 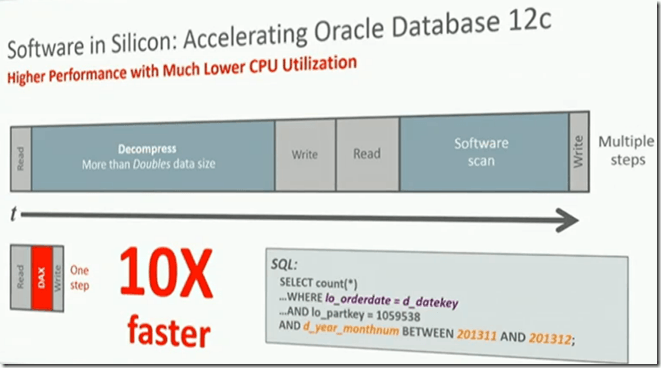 Some new hardware announcements at OOW 2014: Zero Data Loss Recovery appliance (the world’s first and only engineered system designed specifically for Oracle Database protection), Exalytics X4-4 (with up to 3TB of memory) leveraging the Oracle Database 12c In Memory option (instead of TimesTen in memory database). All Flash Storage Array SAN machine: the Oracle FS1 Series Flash Storage System scales to petabytes of all-flash capacity while delivering a multitude of innovations designed to take flash technology to new extremes – getting the benefits from hard disks as well as predictable speed delivery by an all-flash-array. The still fairly new Exadata (X4-8, July) with focus on Database In Memory (12 TB DRAM together with transparent data tiering to flash and disk for less performance-critical data). No new releases of Exalogic and Virtual Compute Appliance. One of the frequently heard themes was ‘real time’. Information or better yet Insight (and recommended or even automated Action) in near real time. Some information is yesterday’s news even before it is tomorrow. Some conclusions have to be reached from data and events within minutes. This requires the capacity to gather the data, analyze it and present findings to human actors in near real time – seconds to minutes. And typically there is a lot of source data involved as well. The slow factor – apart from network latency and the sheer volume of this fast data – is typically us: how to engage a human quickly enough in such a way that insight is nearly instantaneous and the requires action can be performed nearly as quickly. Oracle is working on all pieces of this puzzle – with data visualization at the human end of the chain, event processing in the second step and a variety of technologies at the data gathering beginning of the story (from physical devices – sensors, beacons) to software probes and sensors baked into applications and platform infrastructure. Here we see another type of LoB user enablement: the insight provided by the system has to be interpreted by a business user – not an IT person. Data is not good enough, and even information that still requires considerable analytical and technical skills for proper and quick interpretation will not do. The visualization has to support the LoB user in direct understanding – at least of the need to drill down further (again the glance (see the alert), scan (drill down to understand the importance and perhaps take quick, straightforward action) and commit (look into the details and embark on a more complex response action). We see a meeting coming up between business and technical operations: IT operational staff – system administrators, DBAs, Middleware and infrastructure specialists – monitor in real time, using various types of technical logging to observe, analyze and resolve technical issues. At a more function, business oriented level, they will have counterparts who monitor in real time the execution of the business processes. Disruptions at technical level may very well have consequences at the business level, and if so typically require collaboration between the two groups to resolve. Furthermore, issues in the functional execution of processes may not be visible at all at technical level. It is increasingly important for business representatives to have real time insight in such issues, even before they occur (for example by spotting trends that without action may result in thresholds being crossed). SLA – service level agreements – on both technical metrics as well as business indicators – with corresponding metrics and dashboards are becoming more and more important as longer chains and more extensive business processes are linked and automated. Additionally, with sections of these chains running on a (partly) externally managed infrastructure and platform, deriving business operational insight directly is also more important because using technical logging to indirectly derive business insight no longer be meaningful or even possible. It seems that the DevOps movement – previously more associated with all interaction between infrastructure and platform specialists on the one hand and development teams on the other before a system is taken into production, will have a parallel in the interaction between business operations and IT operations at run time. Oracle is a big place. It offers over 4200 different products, created by a large number of development teams that historically have not always worked together in very close collaboration or even communication. It is my observation that more than ever before, the teams at Oracle are now working together, brought together by a common goal – the cloud – and unified by the common user experience (Alta for short). Almost every team needs to work with other teams because it works on top of (cloud) services provided by other teams. In the world of the Oracle Cloud, there is no room for any product team to create its own incarnation of something that is offered as a generic cloud service. All of a sudden, all across the board teams are actually teaming with each other. I believe that as a result, everyone benefits. Product teams will focus more on their core added value than on generic facilities that they will now simply consume. The functionality and non-functionality of the underlying platform services will improve too, because of the early collaboration and testing that is the result of the internal consumption of these services. The common user experience also results in a feeling of joint responsibility, in addition to aligning the design activities. It seems that this grand mission of bringing Oracle to the cloud is energizing the company – now, more than in many years, there seems to be a spark back at Oracle. A belief in the mission. I liked witnessing this enthusiasm and self confidence.